On my head, shoulders and shoes. I think my Barbour needs reproofing. I had planned on showing you how to make avogolemeno sauce today to serve with a Greeked up meatloaf. It was dinner last night for friends. 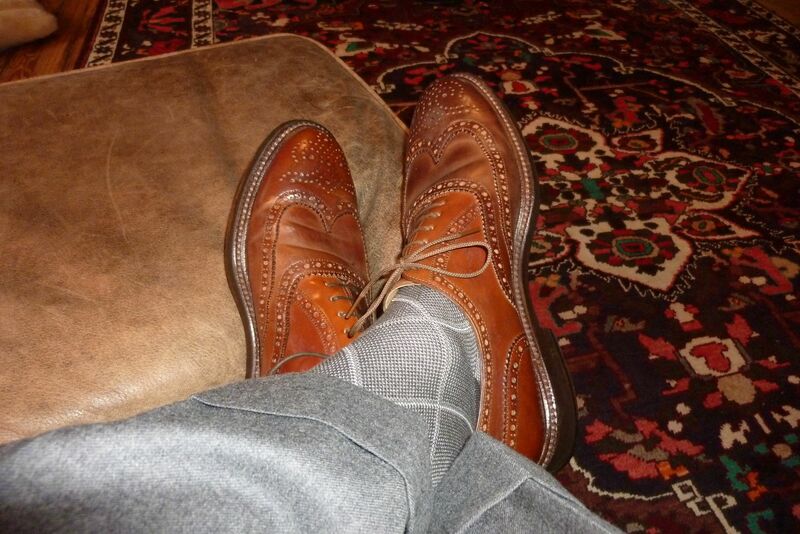 However, with the weather such as it is, and a recent request from a reader to show you my storm shoes…. Ron Rider of Rider Boots and R. Martegani fame made these up for me when he first started carrying the line. “Gunboats” he called them. They are reminiscent of the shoes worn by government employees during the 50’s, 60’s and 70’s. 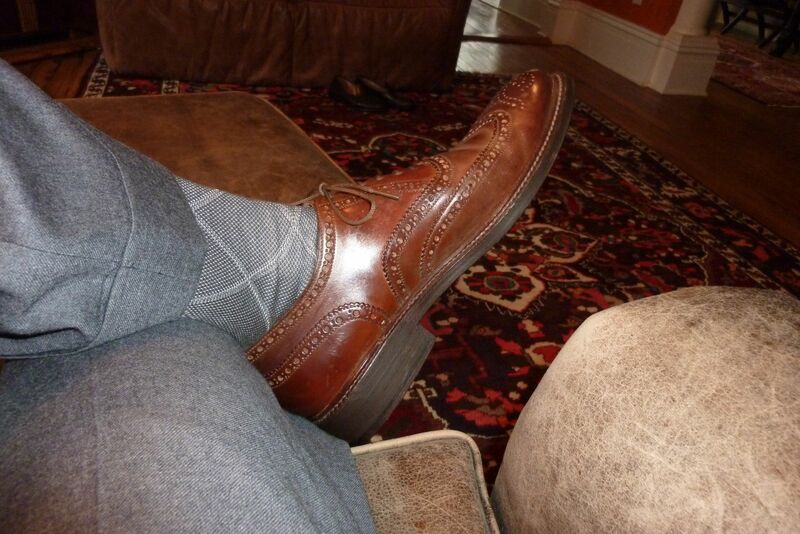 These are shell cordovan, which should be pronounced as Ricardo Montalbán would when extolling the virtues of “crushed Corinthian leather”, made from the rump of a horse. That guarantees that they are all but indestructible. My storm shoes make sure that regardless of the state of the rest of me, my feet are incredibly comfortable and dry. They weigh in a something like five pounds, giving me solid footing in gale force winds and are just the thing for tromping down the median on Monument Avenue in the rain whilst walking a complaining dog whose waxed cotton coat is still waterproof. The double sole and “storm welt” help to keep unexpected puddles from flooding the gunboats. That said, there are days when I must dry them out. Today will be one such day, after my weekly walk to my tailor. To properly dry your shoes, DO NOT subject them to any sort of artificial heat. No ovens with just the pilot light on. No radiators. No hairdryers. Instead, stuff them with newspaper and lie them on their sides. This keeps the cork filling from rotting as far as I understand it. After a day, replace your shoe trees in them, clean and polish as usual. They will last you a lifetime. This entry was posted in Elegantology and tagged Elegantology, R. Martegani, Ricardo Matalbán, Rider Boots, Shell cordovan, Storm Welt, Wingtips. Bookmark the permalink. No wellies for Mr. E. Socks and slacks are great. Sweet mary jane, five pounds? You must have calves like redwoods. I had not heard the “lay them on their side”, but it seems to make perfect sense. I shall try that next year on our one rain day. I think we’re done for this year. Granted, I just cursed us all and the heavens will open for the next three weeks. My father calls all wingtips “gunboats” as well, I’d be interested to know where that term came about. I really like the idea of making avgolemono into a sauce, especially for some meatloaf?! Definitely show us how it’s done! Looking forward to the avogolemeno sauce and Greeked up meatloaf. Mr. E — please – may we have the Greeked up Meatloaf recipe? I’m a sucker for such things, from family recipes no doubt. The Peet Boot and Shoe dryer is a wonderfully simple gizmo and a good $40 investment to preserve footwear. Low radiant heat and no blown air ensures drying without deformation. I’ll stand down from my soapbox now. I love the gunboats reference. It takes me back to a time when such were standard issue in all business dress (in U.S.), and slim italian profiles were given the wary eye. Walking down Monument Avenue? Could it be that we live in the same city? Let’s have the meatloaf receipt. Hello Marty and welcome. We’ve lived in the River City since 1997. My dad used to say that “all roads lead to Richmond (VA)”, and man, was he right. We are in the Fan. Those are beautiful shoes sporting big, aggressive broguing. Stout!